Today’s defence related news includes coverage of last week’s Operational Honours list. The latest Operational Honours and Awards list was released on Friday. The awards are given to individuals who have gone above and beyond the call of duty when on operations and this year there are also several non-operational gallantry awards which were earned by service personnel whilst in the UK. The Times reports on two soldiers who jumped into a burning tank to save their colleagues trapped inside. Sergeant Stuart Griffiths and Corporal Saimone Qasenivalu disregarded smoke and flames to pull two unresponsive survivors from a Challenger II tank after an explosion that killed two other soldiers. The tank had been ready to fire on a target when onlookers noticed a loud hissing sound emerged from within, which was followed by an explosion. Sergeant Griffiths was one of several nearby soldiers who ran towards the burning vehicle to try and help those trapped inside, whilst Corporal Qasenivalu “fought the acrid smoke and lack of oxygen inside the turret to reach the unresponsive operator”. The Operational Honours and Awards show how our armed forces personnel go above and beyond the call of duty to keep this country safe. The breadth of achievement is testament to the bravery and commitment of our service personnel. They make us proud. I congratulate all those who have been awarded. 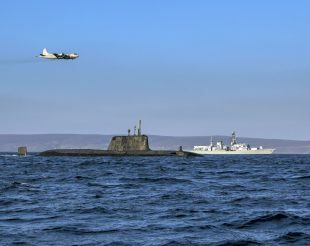 Image of an Astute class nuclear submarine, the Type 23 frigate HMS Kent and a German Navy P3 maritime patrol aircraft. The UK-led multinational naval exercise Joint Warrior 2019 is underway until 11 April 2019. It involves around 10,000 troops from 13 nations and provides a complex environment in which UK, NATO and allied units can train together in tactics and skills for use in a combined joint task force.